3d. [Luxury wheels until 2004], CADILLAC SEVILLE. 11d. [Last Whig president], MILLARD FILLMORE. Namesake of a junior high on The Brady Bunch. 21a. [Hayseed], HILLBILLY. 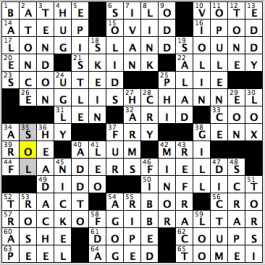 Dictionary labels the term “chiefly derogatory.” Typically, we don’t care to see derogatory terms in the crossword, and there will be plenty of complaints about this one. 54a. [What a stressed-out person may need to take], CHILL PILL. I use jigsaw puzzles as chill pills. V. effective. Simple, basic theme concept that I like 80% of. Works for a Tuesday, unless you take umbrage at 21a. 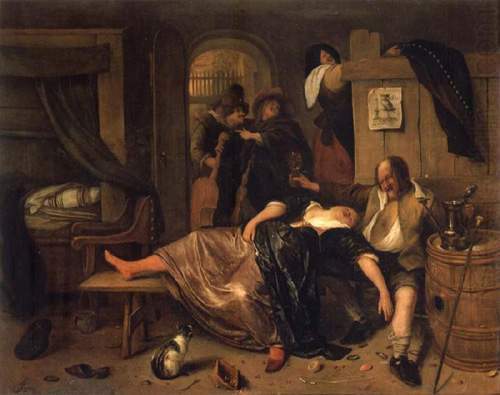 60a. [Scott of “Parks and Recreation”], ADAM. You know who Adam Scott’s character Ben looks like? Team Fiend’s Thursday BEQ blogger, Ben. 53d. [Pat who co-starred in “Journey to the Center of the Earth”], BOONE. A part of Pat Boone’s résumé I did not know. Crosswordese! Roman numeral CMVI, AGUE, HIES, ALIA, TO A TEE, STERE, AGORA, OMOO, ISL? Plus two not-so-easy Chinese names: 30d. [First premier of the People’s Republic of China], ZHOU and 27d. [Third-century Chinese dynasty], WEI. I couldn’t tell you why this puzzle was scheduled for a Tuesday, aside from the simplicity of the theme. 28a. [Musical piece whose name is Italian for “joke”], SCHERZO. I did not know that. Nor do I know what a SCHERZO is, actually. 58a. [Dumbbell], BIMBO. 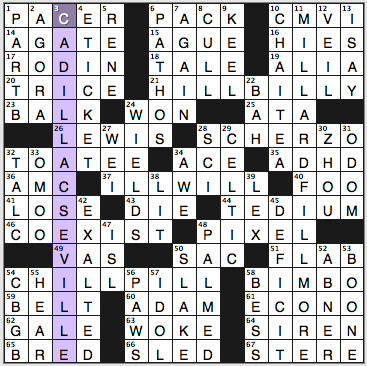 Okay, so the clue is not gendered, but the answer word definitely is, and it’s sexist. 4d. [Convenience at the airport], E-TICKET. It’s more a convenience and cost-saving device for the airlines than a convenience for travelers, no? I like Anatomical Row: a VAS, a SAC, FLAB. 68A [1990s puzzle game set in an island world] MYST – I played this and Riven back in the day. I’ll bet most of you puzzlers did as well. It is primarily a puzzle game. Both available for iOS, if you’re interested! 5D [Aural “shift” named for physicist Christian] DOPPLER – Most notably used for weather radar. Not sure how it works. I missed that day in science class! 6D [___ Dei (“The Da Vinci Code” group)] OPUS – One of my favorite novels. The movie was good, but the book was a page turner, and was full of PUZZLES! Another stellar entry from Matt. Too bad I cannot make it to Vancouver this week! 3.5 stars from me. Until next week. 20A [Nautical distance unit] SEA MILE – Don’t know if this phrase is ever used, but solvable nonetheless. 45A [Big name in hair trimmers] WAHL – I actually own a Wahl hair trimmer! 64A [Yankee who passed Willie Mays on the career HR list on 5/7/2015] A-ROD – Or Alex Rodriguez, who thanks to his off-field steroid exploits is very famous and helps non-sports savvy solvers! 2D [“Hollywood Squares” win] OOO – I miss this show! One of the many game shows I used to watch when I was little. Who didn’t like Paul Lynde?! 44D [State whose name is part of its capital] INDIANA – Capital being Indianapolis, of course. Always weird seeing a reference to where I live! “Sometimes you feel like a nut—sometimes you don’t…” Sometimes a puzzle really strikes your fancy—sometimes… Today’s “Crash Course” was one of those very rare Gorski puzzles that missed the pleasure-in-solving mark for me. The anagram theme is just fine; ditto most of the themers. But the overall fill left a lot to be desired and left me wanting something more. No matter how winningly clued, I wanted more actual words (and fewer partials and abbreviations [RGIII? “YIKES!”]), more sparkle (and less crosswordese [ASA, ESA, EDOM, ET AL. ), more longer fill (a little more than 80% of today’s fill is made up of entries that are five letters or less…). 71A. 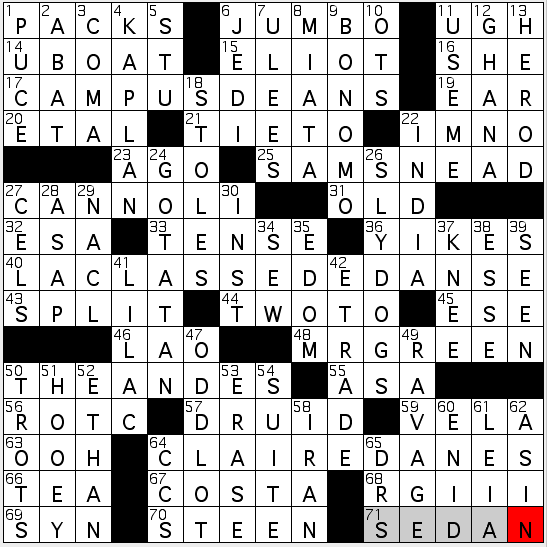 SEDAN [Town car that’s “cracked up” in five horizontal answers (it’s the puzzle’s theme!)]. Yes, it took me until this clue for the theme to come into focus. Which I take as a plus. While it only works for the three longest themers, I kept thinking there was a “CD” tie-in. Somehow the “coincidence” of the last five letters of all of the themers being the same eluded me. D’oh. But I have to say, once the anagram gimmick was clarified and I saw how the long themers worked, I was then made uncomfortable about the idea of all these automobile crashes in my puzzle. The wordplay is fine. It simply didn’t appeal to me. And we are in **highly** subjective territory here. 17A. CAMPUS DEANS [College bigwigs]. A tad dry, but yes, they are. Also, kinda fitting that the “P” here is crossed by the education world’s KAPLAN [Test prep company]. 25A. SAM SNEAD [Golf legend who said, “Of all the hazards, fear is the worst”]. Wise words, but see also: FDR’s first inaugural address. For this puzzle’s purposes, and where notable quotes are concerned, there’s far more life in Clemenza‘s classic instruction to [“Leave the gun. Take the CANNOLI…”]. Great clue and fill, that. 40A. 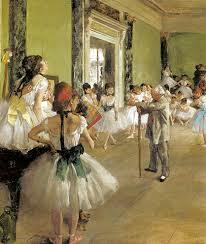 “LA CLASSE DE DANSE”[French title of a ballet scene by Edgar Degas]. Totally classy fill. 50A. THE ANDES [High points during a South American trip?]. Oh, and they are! BONOMO [Longtime maker of Turkish Taffy]. How many teeth did you lose to this confection? ODD LOT [Fewer than 100 shares]. Is this a purchase you could make on E-TRADE [Hi-tech investment firm]? And that’s a wrap for today. Have a good week, all. Already looking forward to the next week’s offering! 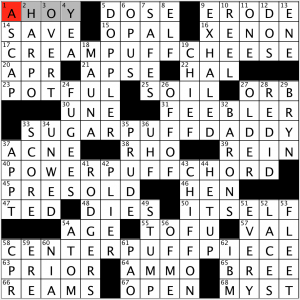 CrosSynergy/Washington Post crossword solution, 07.07.15: “Where am I? Good morning, crossword fans! My apologies for being MIA on Monday, but running around and tracking down almost 25 teenagers all day will make you have a tough time getting on to here. (I promise to put up a quick review of yesterday’s puzzle soon, from Mr. Patrick Jordan.) Today’s offering, from Ms. Lynn Lempel, has four theme answers that are actual geographic locations, but puns are used as their clues to play off the location names. ENGLISH CHANNEL (26A: [The BBC]) – “BBC one, BBC two, BBC three, BBC four, BBC five, BBC six, BBC seven, BBC heaven!” Much love to someone who mentions the movie I’m referencing with this song number in the comments. “Sports will make you smarter” moment of the day: NICKEL (45D: [Cost of a bottle of coke for 73 years?]) – Fitting that I use this term given that I’m currently at a football camp at the moment. A NICKEL defense is an defensive alignment in which five defensive backs (cornerbacks/ safeties) are in during any one given play, as compared to the standard four defensive backs in a base defense. It makes sense to have “nickel” as the term for a defense with five DBs, but doesn’t make as much sense of having the term “dime” describe an alignment with six defensive backs. Have a great day, everyone, and I’ll see you on the top of the Hump for Wednesday! This entry was posted in Daily Puzzles and tagged Daniel Raymon, Elizabeth C. Gorski, Lynn Lempel. Bookmark the permalink. HILLBILLY does not bother me. I think of it strictly as a regionalism to refer to people from the Ozarks or Appalachians. I know it also connotes being poor and uneducated, but for some reason I see the use of the term as more affectionate than derogatory. I’m from North Carolina. My parents knew a famous moonshiner. He was the main subject of the documentary Hilllbillly. I guarantee that hillbillies own the term far more deeply than they are offended by it. Some African Americans similarly own the “n-word”, but that doesn’t change the fact of the offensiveness of the “n-word”. Typing “False equivalence” does not an argument make. While I’m sure you’re correct that some small portion of the population has a positive self identity of being a hillbilly, the remaining 99% neither share a positive view of hillbilliness, nor when they call someone a hillbilly are they joining in this self love. They’re being insulting. Then we shall continue trying to raise consciousness here. People! Constructors! Editors! If you see BIMBO in the grid, know that it is crappy fill that will alienate a good chunk of the solving audience, and just check to see if LIMBO will work instead, or possibly JIMBO (though it’s harder to clue accessibly: https://en.wikipedia.org/wiki/Jimbo). It’s really not difficult. It just takes viewing the word as one you’d like to excise from the grid. And there’s that unspoken elephant in the room, BILBO; telling that that’s the first thing that came to my mind when the OP suggested replacing a letter with L.
I misunderstood, too, forgetting about the theme answers. I think I’ve seen both HIMBO and MIMBO as male versions of BIMBO. Either would work in the puzzle (Hess oil company), but LIMBO seems like the simplest alternative. Yes, you certainly can by an ODD LOT on E*TRADE. 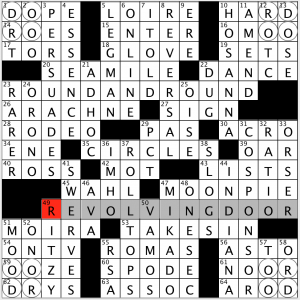 I agree that this Crossword Nation was a little less fun than the typical one, but overall it has been a puzzle subscription that I have greatly enjoyed. I think E-Tickets are convenient for travelers, because you don’t have to wait for the tickets to be mailed or stop by a ticket office to pick them up, and most importantly you don’t have to remember to bring them on travel day! Loved SCHERZO. Really. No joke. JNZ – Minor nit – the Doppler effect is visual as well as aural. Anything involving waves. NYT: Regarding BIMBO, as I loathe Tolkien I’d rather see the entry stay the same and simply be clued differently, divorced entirely from the pejorative connotations. Grupo Bimbo is the 7th largest corporation in Mexico and has extensive distribution in the United States. NYT: What I didn’t care for, however, was the bizarre clue at 56d [Things that big nails stick out of] for PAWS. Nor was I thrilled about the singular 64a [Obstacle for Odysseus] SIREN; that just doesn’t comport smoothly enough with the narrative. No MILLI VANILLI references yet? Should I blame it on the rain? Enjoyed the LAT, but thought the obvious answer to 41-D, [Tries to avoid a pothole], was DRIVES IN MICHIGAN. NYT: I agree with the comments above re: BIMBO, HILLBILLY. A note on TOFU: It’s quite easy to be a vegetarian and never eat any soy products. I’ll eat TOFU if there’s nothing else but it’s not something I like. I think my non-vegetarian friends like it more than I do.